Rockmere Lodge was constructed in 1899 by Mr. George Stearns from Cincinnati, Ohio. Built in the shingle style of the era, it commands an unsurpassed view of the Atlantic Ocean. The Stearns family came here from Cincinnati every summer. There are photos of a circus set up on the front lawn to celebrate their daughter, Mable Stearns’, birthday. In 1915, Mr. Stearns and his son, Gordon, died and Mrs. Stearns and their daughter, Mable, continued to summer here. In 1919, Mable Stearns married a man named Stonehill. 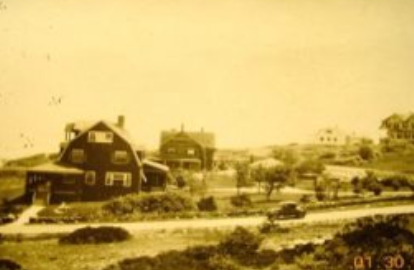 Mr. Stonehill was very talented and during his life he created a vast garden display in the front of the house which was called “Tiny Town” as it consisted of several wood and stone replicas of buildings in Ogunquit. The only example of these buildings remaining is a replica of the Ogunquit Library and is now located inside the library building. When most places in Ogunquit did not have electricity or indoor running water these gardens had lights and water treatments. Also it was said that Mr. Stonehill enjoyed giving the local children rides on his miniature train that ran through these gardens. When renovating we still find cast iron underground water pipes. There also was a wind mill on the property, the stone base of which is just to the south of the driveway at the front of the property between the pergola swing and the road. Being a summer home for the Stearns family, Rockmere Lodge was in use for only 3 or 4 months a year then closed up for the rest of the year. 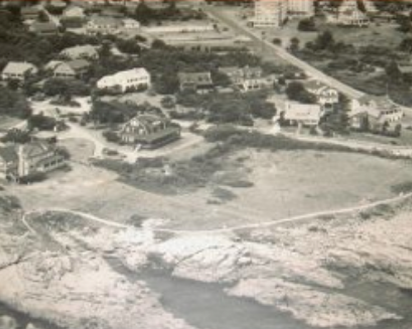 Rockmere Lodge stayed in the Stearns family until 1950 when Mable, who had inherited the property, sold it because of the difficulty of traveling from Cincinatti to Ogunquit because of her age. We believe she spent the remaining years of her life in California.